Cali-Kat lets me dress her up all the time ... such a good sport! Comments for Easter Wishes From BunnyDog! YOU ARE JUST ADORABLE CALI, HOW GREAT THAT YOU STAY SO QUIET AND POSE FOR MOMMY. HAPPY LATE EASTER WISHES TO YOU AS WELL. 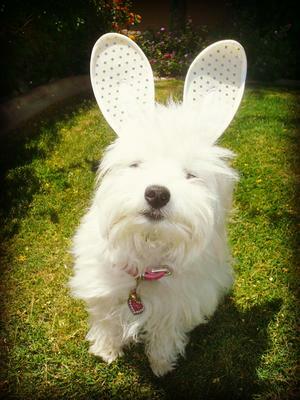 What a cute Easter Coton. Happy Easter to ur family. Cali is beautiful as a bunny but then she would be beautiful anyway. Happy Easter to you and Cali from Molly, Sandy and me. So pleasing to see a coton looking so perfect as bunny!